Introduction: My number one goal when creating guitar pick jewelry was to use what I already had. I didn't want to buy materials, I wanted to find them. I wanted to utilize what was laying around in my cabinets, garbage and recycling. Over the years I have amassed a sizable amount of old CDs and DVDs I used for performances in the past. Even though I didn't need them anymore I hung onto them. And now I've finally got a use for them. 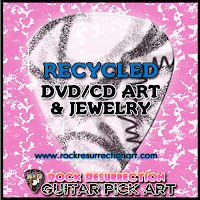 You can do a Google search and find many things, especially on Pinterest to create from old CDs/DVDs. I found out a while ago that they are too thick to cut with a Pick punch on it's own. It needs to be split in half. I figured this out my accident, while cutting a DVD down the middle. It popped in two and to my delight I could finally cut it with ease. I tried separating the two layers with nail files, pins, and it was basically impossible. So don't bother trying to split it, just cut it down the middle. Other folks have noticed this too. Check out my tips & tricks blog entry for Making Vinyl Art! The end result with the Pick Punch was shiny silver and blue surfaces. I am currently processing these picks and will post photos when I'm finished! I wanted to try a few things with the DVDs and CDs I have. I cut a CD in half and mimicked a Recycled CD Necklace I found on Pinterest. I'm doing a mosaic on it, and I'm referencing Egyptian collar necklaces. 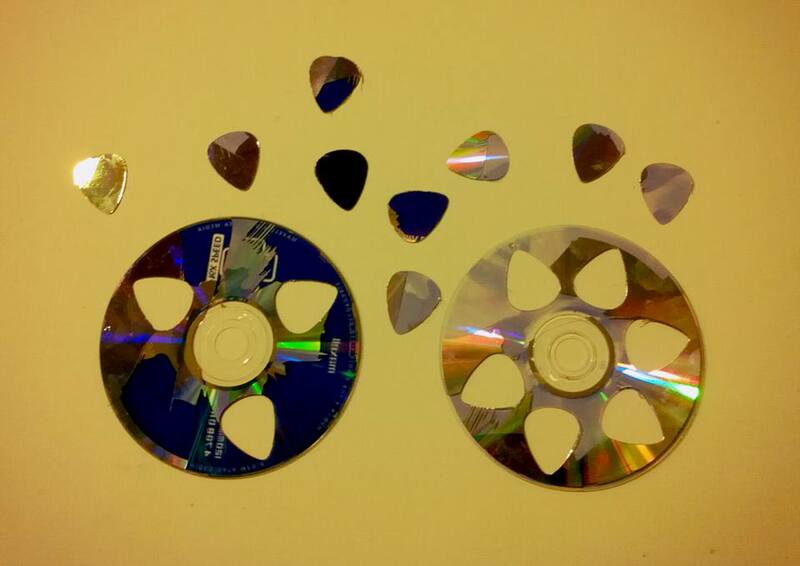 I've also cut apart a CD into shapes and plan to create something from those. Get old used DVDs, like the kind you burn data on. CDs really can't be cut down they same way but still can be made into things. The best way to successfully cut shapes (guitar picks with a Pick Punch) is to first split DVD by cutting it down the center. It pretty much just pops apart! Then put a segment in the Pick Punch and take care when punching because it can start crunching! DVD material is obviously pretty delicate, but with pretty results!